The Speedster family of motorcycle exhaust systems is Cobra USA’s premier line of full exhaust systems. The Speedster 909’s are one of the best value for money exhaust systems available on the market today. But what sets this entry-level exhaust apart from the competition? Let’s take a look? All Speedsters feature the Cobra PowerPort, Cobra’s proprietary crossover technology that helps to increase overall power from idle to redline. This device connects both exhaust pipes from the front and rear cylinders, and promotes improved exhaust scavenging. With the exhaust gasses being eliminated faster, airflow through the engine is promoted, providing more power. The result is performance gains that resemble those seen on high-performance 2-into-1 exhaust systems, whilst retaining the classic 2-into-2 look. The attention-to-detail on the Speedster 909’s defies their price tag. These triple-chromed, shotgun-styled pipes feature full-length, 222-degree heat shields. A laser engraved logo and a chrome inner tip add a touch of class to the classic, straight, 2-into-2 style. Cobra USA exhausts are made in the USA to the highest standards. The Speedster 909’s receive the same love and attention as their higher-priced siblings, at a fraction of the cost. All Cobra exhausts are built to the highest standards and are thoroughly inspected before distribution. So if you’re bike is lacking some power and style, Cobra USA Speedster 909 ticks all the boxes. Power, style, and great value for money. 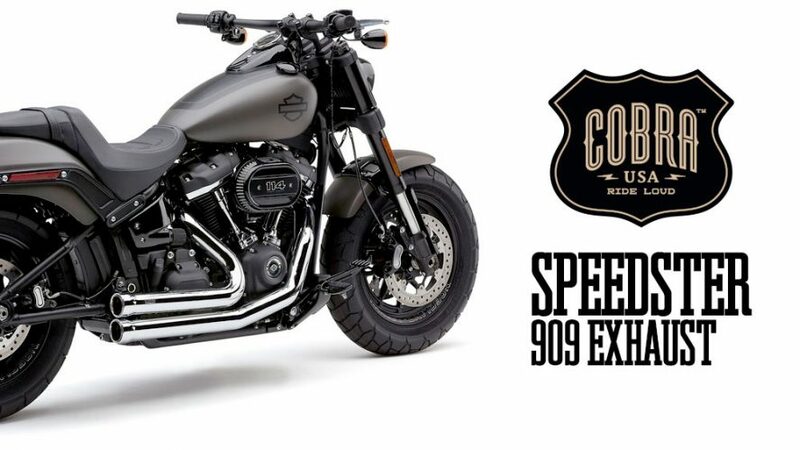 Speedster 909’s are available in black and chrome for most H-D models. Prices range from $622 to $669 RRP. View the full Cobra USA range at www.v-twin-exhaust.com.au and use the filters to see what’s available for your make and model.